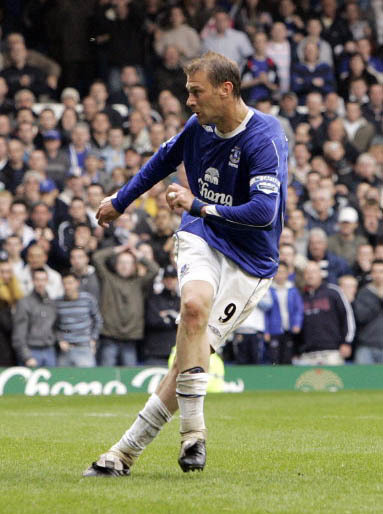 And so we get to number nine from our (former) number nine, the final game of the 2005/06 season. Predicatably, our season had petered out to nothing and all that we had to play for in the final game of the season was the possibility of a top half finish...all we had to do was beat the already relegated West Brom (provided Wigan didn't win their final game)! But things are never that straight forward are they?! The day became much more than that though as we saw off two, very different, Everton legends. Firstly we had the emotional send off for a truly great Evertonian in Brian Labone. It was a genuinely moving moment, even for people like myslef who had never met or even seen the man play. And full credit must go to the Albion fans who were nothing short of magnificent in their show of respect! But then the game started...and we all know how that panned out! With a minute to go things were looking bleak as, despite absolutely leathering them, we were 1-2 down. Then we were awarded a penalty which Arteta handed over to Ferguson to bring the curtain down on his Everton career in style! He really didn't look like he wanted it, after all, he's always been last at spot kicks! Everyone must remember the way he bottled out of taking one against Sunderland in a shoot-out in the League Cup a few years ago! But destiny was calling our captain for the day so up he stepped...and missed! Well the 'keeper (who had had a real blinder!) saved it. But he could only parry out to the edge of the six-yard box and the big man smashed it through the 'keepers' legs to notch up his last goal in an Everton shirt...not with his head, not even with his left, but with his weaker right foot! Everton were minutes from finding themselves in the embarrassing position of being booed off in the final game of the season and then having to come out and do a lap of honour! To make matters worse, we would also have become the only team that West Brom had done the double over during their three seasons in the Premiership! 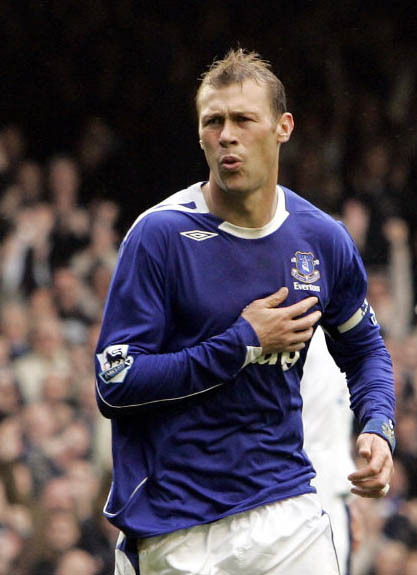 But the big fella's final act was to save us from that embarrassing fate and he scored the final goal in his final game in an Everton shirt...just! We then cheered him off and he deserved to milk every last second of that lap of honour because, no matter what people may say about his discipline and attitude, he's an Everton legend! Not in the way that Brian Labone is, but an Everton legend none the less! So nice one Dunc, we'll miss you! And we all saw you crying as you went off...you big girl!